Isaiah is a prophet with whom we’re all familiar, even if just by name. In terms of length, Isaiah takes the cake for the Old Testament prophets at a total of 66 chapters. It is often called “The Fifth Gospel” because it bears witness to Christ unparalleled by any book in the OT. He prophesied for close to 79 years, during what is arguably the worst time in Israel’s history. Put simply, the people have turned their back on God in a serious way, for a seriously long time (think idol worship, really bad-behaving kings, and exile). But God gave Isaiah a message to share: Despite the deep darkness in which Israel found themselves, a great light would come. For Isaiah, the vision of God’s majesty was so overwhelming that military and political power faded in significance. He constantly called his people back to reliance on God’s promises and away from vain attempts to find security in human plans and intrigues. Isaiah is known for his 4 “servant songs.” This verbiage resurfaces in the New Testament (and in today’s Gospel). Isaiah writes to a people who are familiar with kings being anointed in their land at huge ceremonies. They would have heard this kind of language at one of those ceremonies – for example, when David anointed Solomon. In speaking to them in this familiar style, his message is more likely to stick. The psalm is always a response to the first reading. Today’s response assures us that though the people are in darkness, the Lord will bless His people with peace. Interestingly, He doesn’t promise to bless the times and seasons with peace (look at all the unrest around us today and throughout history), but he will bless His people with peace – peace in their hearts despite what’s happening around them. Take comfort in Christ our Savior. True peace will be achieved at the Second Coming. Until then, be a people of peace, a light to the nations. More verbiage here of kingship in verse 3 (“enthroned). In this pivotal scene from Acts, Peter, the Rock on whom Christ built the Church, the first Pope, makes a striking announcement to the people – and to us. Salvation through Christ – which comes through baptism – is not just available to Jews, but also to the Gentiles! This was a shocking discovery. Let’s pause and consider why this is. Up until this point, the people who believed Christ was the Messiah were elated to know that all the prophecies of old were now fulfilled. The Messiah had come! But it’s a sticky moment in Church history to a degree. Everyone who was looking forward to the coming of the Messiah – including the Apostles and Jesus himself – were Jewish. So to them, their Messiah had come. The answer promised to them for generations was here. But they didn’t really understand that this was now a New Covenant – an advancement or fulfillment of the Old. They didn’t know it would mean a “new faith” (Christianity) – new practices, new teachings. The concept of a “new faith” or “a new Church” was not yet established. Many of Paul’s letters are written to clarify these complex, generations-old traditions: “Do we still need to be circumcised? Can we eat ‘unclean’ foods? What are the new rules?” If I were Peter or Paul, charged with that task, I can only imagine the reliance I would need to put on my prayer life and the work of the Holy Spirit. Sometimes in our own lives we enter a new chapter. It’s not the same as the old! Going from high school to college. Going from internship to a paid position with benefits. Going from dating to marriage. From married couple to family. From working life to retirement. What are the new ways of doing things, and what are the old? How do we adapt? Back to the reading: So who’s Cornelius? He’s a Roman Centurian – a Gentile. In the reading, Peter preaches the Gospel to Cornelius and other gentiles for the first time. Here’s where it gets cool. After preaching the gospel (keep reading in Acts 10), Peter sees the gentiles experience the same things that had happened at Pentecost – like speaking in tongues – and he recognizes this as a “second Pentecost.” Peter proceeds to baptize this group of men. This is Peter’s “a-ha” moment: He knows with certainty that God wants ALL people to receive salvation through His Church, beginning with baptism. From this point forward, Peter takes this message out to the world begins to preach to all people. The prophets of old said “Before the Messiah comes, look for Elijah.” John the Baptist is acting like “the new Elijah” – who leads the way to Jesus. John brought words of power to the people to whom he preached, and the people thought he might be the Christ. 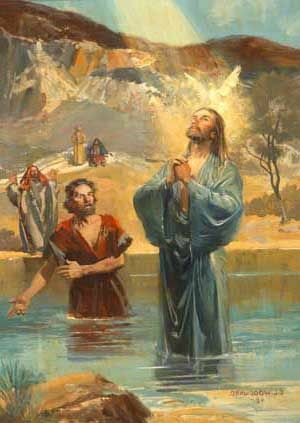 In the reading, the people are baptized, and Jesus goes last. Jesus puts His people before Him. Wow. At this moment, for the first time, we see all three persons of God present simultaneously: Jesus is there, the Holy Spirit descends on Him like a Dove, and the voice of God the Father is heard from above quoting the servant song of Isaiah 42: “You are my beloved Son, with You I am well pleased.” Wow again. Where in our lives do we need to be cleansed? Where do we need to be ‘re-created’ and begin anew? Although we’ve already been baptized, our sacramental life – through Eucharist and Reconciliation – are the tools Jesus left on Earth for us so that we would have access to His Sacramental, Heavenly Grace.